is to support the implementation of the international standards for Identification of Medicinal Products (IDMP) but in the shorter-term it is to support the implementation of the eXtended Eudravigilance Medicinal Product Dictionary (XEVMPD). EMA and FDA submission codes help you make your IDMP project a success! 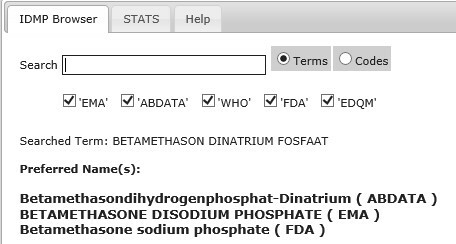 You are kindly invited to explore the beta version of the first terminology browser in pharmazie.com for Health Professionals in the eSubmission.